Douglas A. Courter is the new Associate Pastor of Church Ministries at Valley Grace Brethren Church, Hagerstown, MD (Dan Pritchett, pastor). Courter had been senior pastor of the Calvary Grace Brethren Church of Hagerstown for 14 years. Prior to that he was the associate pastor of the Winchester GBC in Winchester, Virginia for 5½ years and Pastor of Youth, Music and Christian Education at the Canton GBC in Canton, Ohio for 8½ years. Pastor Courter was born in Toledo, Ohio, and grew up in that area with two older sisters and a younger brother. He received his B.A. degree from the University of Toledo, in Toledo, Ohio, in 1978 and his Th.M. degree from Grace Theological Seminary in 1983. His area of specialty was in biblical counseling. In 2005 he began his Doctor of Ministries program through Grace Seminary and went to Africa on a teaching trip March 2005. 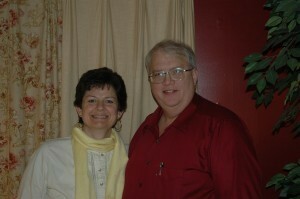 Pastor Courter was married to Barbara Winstead in 1981 and they have four children: Karen, David, Kellyann and Benjamin. Pastor Courter has been actively involved in the Mid-Atlantic District and North East Ohio District Youth Committees and has served on many other committees. He has also been involved in Momentum (formerly, Brethren National Youth Conference) since 1983. He has served in many capacities, including a number of years as a Quiz Master in the National Bible Quiz program. This year he began to function as the National Director of that program. He is currently the Chairman of the Ministerium and the Chairman and Treasurer of the District Missions Board. He served on the Fellowship Council (filling a two year opening) of the FGBC and was then reelected for a five year term on that Council. He has also served on an advisory committee to the Washington County Board of Education. It was in 1969 that Douglas Courter trusted Christ as his personal Savior as he was traveling back from a vacation in Florida. His cousin had been faithfully witnessing to him for the past number of months and had impressed on him again his need to ask Jesus to be his Savior. So, in the car, somewhere in Alabama, he received the forgiveness of his sins. God continued to work in his life until, just a few years later, he dedicated himself to full time Christian service. Courter has many interests, but travel, golf, and computers are his main hobbies. In the fall of 2001 he began teaching Information Technology classes part-time at Hagerstown Community College, including teaching at the Maryland Correctional Training Center, a prison outside of Hagerstown.